I'm one of those people who have earbuds perenniall stuck to their heads. I'm always listening to podcasts and admittedly get a silent thrill whenever I see my queue refreshed and have something new downloaded on my phone. Not everything I listen to is spiritual (I do love a good true crime podcast and am constantly listening to political discussions), but when I'm jonesing for some woo in my life, these are my go-to's. 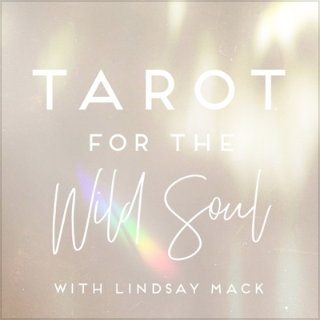 Tarot for the Wild Soul. I've been a follower of Lindsay Mack since the first time I stumbled upon the Brooklyn Fools website. I love her (humorously irreverent) rambles, her super intelligent insights, her lineup of guests. Her chuckle can put anyone in a good mood. Lindsay doesn't just talk about how people do spirituality, she also delves into the moon phases, card meanings and astrology. Cosmic Cousins, Soul-Centered Astrology. It was because of my discovery of Brooklyn Fools that I found about Canyon Rainmaker, who leads a super cool existence somewhere in Hawaii (you literally HEAR Hawaii in the background as he speaks). I don't know a lot about astrology but I'm learning a little, thanks to this podcast. His voice is also incredibly soothing—I love listening to this as I wind down before bedtime. Oprah's Super Soul Conversations. I will drink Oprah's (and Gayle's) Kool-Aid whenever, wherever. Every week Oprah talks to an inspiring super soul and generally discusses spiritual transformation, life-changing adventures, and yes, the mundane things too. You don't have to be going through a crisis or be at the grips of some existential dilemma to feel an incredible charge of catharsis whenever you listen to this podcast. Key Finding. I'm a Carrie Mallon fan, hands down. I've been following her blog (and occasional YouTube videos) for years now and she is one of my go-to readers for when I need someone else to draw cards from me. In Key Finding, Carrie tackles the tarot and consequently gives me great refreshers when I feel I'm limited to just my own meanings of the cards. The latest episode I listened to was a more free-flow, ramble-y kind of discussion, which was just as lovely as her more structured pods. Menage a Tarot. The conversations that David, Kate (one of my YouTube favorites!) and Ronda share aren't just information-packed, they're diverse and really interesting. Listening to these three riff off each other feels like you're sat with a group of tarot friends, having a casual chat. There haven't been any episodes recently but if you're new to them, give the archives a good run-through.